"The time to fight is now." 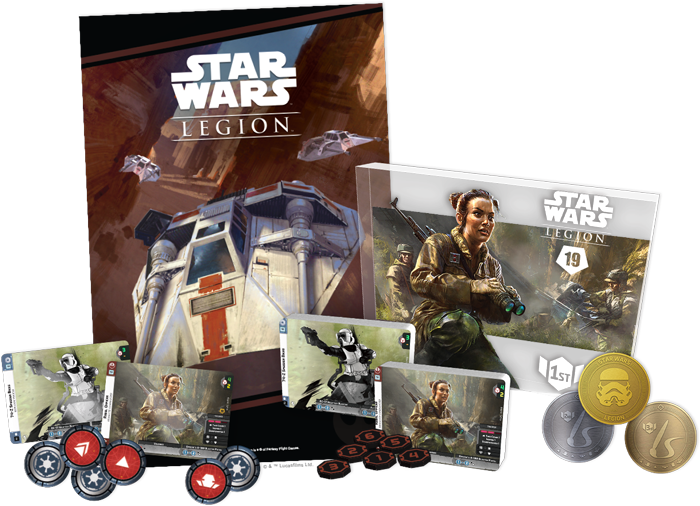 As the Galactic Civil War continues to rage, the battles of Star Wars™: Legion keep growing and expanding. Across countless star systems, new planets are drawn into the fray, and their citizens rise to answer the call to battle. Some will become Stormtroopers, trained to fight for the Galactic Empire. Some will become Rebels, inspired to fight alongside heroes such as Han Solo, Sabine Wren, and Jyn Erso. And who will lead them? Who will command these forces into the forests, deserts, snow, and trenches? Who will stand with them in the heat of battle? Who will guide them as laser blasts spark the night skies? Who will rally them to victory? Will it be you? The Star Wars: Legion Rallypoint Qualifiers are nearly here, and both sides of the Galactic Civil War need new squad leaders. Now is your chance to prove your worth. Earn your promotion. Squash the Rebellion. Or strike a blow for galactic freedom. Make your plans to compete in one of these exciting tournaments. Find a Rallypoint Qualifier near you! While it's a great chance to raise your game and fight a bigger battle, a Rallypoint Qualifier is more than just another chance to prove yourself against enemy battalions—it's also a chance for you to win an array of exclusive prizes! Participation: You'll need troops for the battles ahead. Fortunately, you'll get some! As soon as you arrive at your Rallypoint Qualifier, you'll earn two alternate art participation prize cards—one Rebel Officer and one 74-Z Speeder Bikes. Top 16: Battle through the front lines and into the Top 16, and you'll claim your first performance prize—a Rebel token bag. The Rebel Alliance's iconic logo features in white print atop this 6 by 9 inch, wide-mouthed black bag, making it an obvious place for Rebel troop commanders of all sorts to store their command tokens. Top 8: By the time you reach the Top 8, you'll be ready for any ground battle—and you'll be able to command your Imperial army with this complete set of Imperial acrylic command tokens, which includes enough tokens of each unit type to assemble any legal Imperial army. Top 2: The resilience of your troops and the polish of your commands may very well prove the difference between victory and defeat. Accordingly, if you reach the Top 2 at a Rallypoint Qualifier, you will receive a double-sided, spot-glossed plastic card with the Rebel Officer on one side and the 74-Z Speeder Bikes on the other. The units may function the same as others, but yours will now be far more durable and refined! Champion: Should you conquer the battlefield and claim the title of Rallypoint Qualifier Champion, you'll receive a stunning art trophy, featuring the artwork featured on the alternate art Rebel Officer card. But more than this, you'll be promoted to help your side win an even bigger battle! The Champion of each 2019 Rallypoint Qualifier wins an invitation to the 2020 High Command Invitational and—by extension—takes a massive step toward qualifying for the 2020 World Championship! 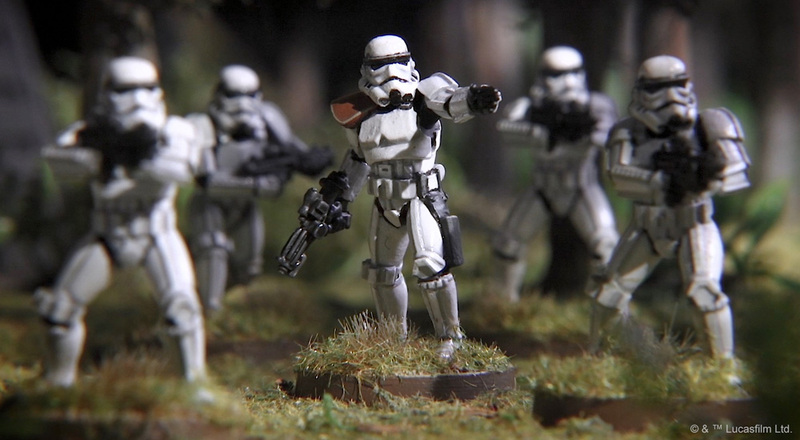 As the miniatures game of Star Wars infantry battles, Star Wars: Legion is your ticket to a galaxy full of adventure, drama, and explosive combats. 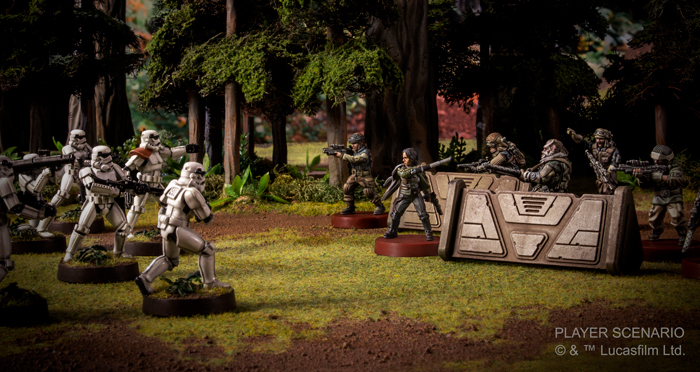 You can send battalions of Stormtroopers into battle against the Rebellion's most notable heroes. You can march across the battlefield with AT-STs or fire tow cables from your T-47 Airspeeders. You can customize and paint your miniatures. And you can customize your army for action on any battleground. Then, when you're ready to play your part in the larger galactic conflicts—when you're ready to deploy your troops—it's time to find a Rallypoint Qualifier near you and head to battle! Support the Galactic Empire, or fight for freedom. Meet the greatest troop commanders from your region and neighboring regions. Find the game played at a whole new level. Elevate your game, and vie for exclusive prizes. Visit our list of Rallypoint Qualifiers, and make your plans to join the Galactic Civil War at a location near you!